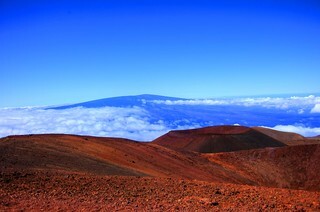 After driving up to the upper reaches of Mauna Kea on the Big Island of Hawaii, I spent a lot of time just gazing out at the world below me. With a summit that is 13,796 feet high, the top part of the mountain is above the cloud level. The red barren landscape was very unreal, especially when it connected with the cloud line, and then further on the other mountain (Mauna Loa).